OTTAWA — The federal government is making it more difficult for Canadian expats to vote, a move that is likely to suppress Liberal party support, data compiled by the Huffington Post Canada suggest. 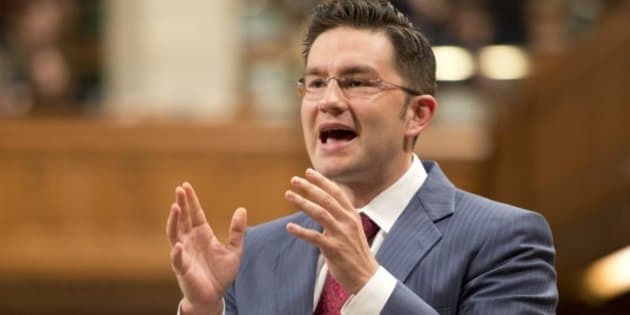 Wednesday Democratic Reform Minister Pierre Poilievre said the new bill, the “Citizen Voting Act,” would put an end to the possibility of riding shopping by ensuring that non-residents can receive a ballot for only the Canadian address at which they last resided. Right now, Canadian citizens living abroad can choose the riding they want to vote in, within certain limits. But once that place of residence is selected, they cannot switch to a different riding in a future election. Last May, more than a million Canadians living abroad suddenly became eligible to vote in the 2015 election after an Ontario court judge struck down a law barring those who have lived outside Canada for more than five years from voting. Currently, non-residents don’t have to provide information showing an address; they need only prove that they are Canadian. The measure in effect prevents Canadian expats who have lived abroad for several years from voting. They are unlikely to have a provincial driver’s licence or other government photo ID – which typically expire after five years – or documentation, such as bills with the address of their last place of residency. “You couldn’t just use your passport [now], because it doesn’t have your address on it,” said Diane Benson, a spokeswoman for Elections Canada said Wednesday. The Citizen Voting Act also eliminates the international register of electors and stipulates that those living abroad have to register to vote — with the new identification requirements — at every single election and only after the writ is dropped. This makes it more onerous for non-residents to vote. Elections Canada currently recommends that expats sign up weeks if not months beforehand to ensure that the agency has their information and that they receive their ballots automatically when the election is called. “Apply as early as possible, to allow enough time for the ballot to be sent to you and for your marked ballot to reach Elections Canada in Ottawa no later than 6:00 p.m., Eastern Time, on election day,” one note in bold states. Shaun O’Brien, the lawyer with Cavalluzzo Shilton McIntyre Cornish who successfully challenged the five-year limit said the federal governing is circumventing the court’s decision. “It’s doing indirectly what they can’t do directly,” she said. “It’s a run-around. What they are most concerned with is having these people vote at all." Elections Canada data from the last federal election suggest that Canadian expats, prisoners and Canadian Forces members who vote by special ballot in urban ridings, such as the Greater Toronto Area, tend to vote for the Liberal party. In 2011, the Tories won 65 per cent of the seats in the vote-rich GTA, which has more ridings than all of British Columbia. Sources say the Conservatives believe they will face stiffer competition in the 2015 election, when another 11 new ridings will be up for grabs in Toronto and its suburbs. HuffPost Canada reviewed the Elections Canada data for 43 GTA ridings from the 2011 election. In 34 ridings, Liberal candidates received the most votes from special ballots that included Canadian non-residents. However, the Liberals won only five seats among those 34 ridings. Although the number of these special ballot votes was small, the margin was significant. In Scarborough–Rouge River and Scarborough–Southwest, Liberal candidates received more than twice as many votes among these special ballots as their closest competitor, yet came in third overall in the ridings. Because three groups of voters who use these special ballots – prisoners, expats and military members – are lumped together in the data, there is no way of knowing with certainty how out-of-country citizens vote, Elections Canada spokesman John Enright told HuffPost. In Etobicoke Centre, Conservative candidate Ted Opitz won by just 26 votes in 2011. But Liberal rival Borys Wrzesnewskyj received 67 special ballot votes from the group including expats, while Opitz received only 25. In close races, those special ballots can make or break a candidate. A large number of special ballot votes from expats could also have made a difference in other tight races during the 2011 election, such as Don Valley West, Don Valley East, Etobicoke Centre, Mississauga East–Cooksville, Scarborough–Guildwood and Willowdale. In 2011, barely 6,000 votes were cast by expats. Canadian Forces personnel cast approximately 26,000 special ballot votes while almost 15,700 prisoners voted. In his May 2 ruling, Ontario superior court judge Michael Penny delivered a blistering critique of the government’s arguments. He said the Canadian Charter of Rights and Freedoms gives every citizen of Canada the right to vote regardless of residency. The Attorney General also said the limit is needed to maintain the integrity of the voting system. The judge, however, felt that expanding the right to vote to citizens living abroad would have a negligible impact on future elections. “In the most recent election, in the 10 Canadian ridings with the highest number of special ballots, as a percentage of total registered electors in the constituency, the non-resident votes ranged from a low of 0.05% to a high of 0.2%,” Penny stated. Elections Canada had also no evidence of any documented problems associated with non-resident voting, he added. In 20 years, there had been no complaints raised about electoral abuse or about the effects of voting by any Canadian voters living abroad who were excluded from the five-year limit, Penny said. “In my view, the vague assertions of unfairness to resident voters and the speculative nature of any negative impacts cannot outweigh the substantial, deleterious impact of stripping a Canadian citizen of his or her right to vote by virtue only of crossing the five-year non-resident threshold,” he said. The federal government tried unsuccessfully to persuade the judge to stay the decision. An appeal is set for January 6 and 7, 2015. “Our government believes non-residents should have a direct and ongoing connection to Canada and to their ridings in order to vote in federal elections. For over two decades, Canada’s policy has limited to five years the length of time someone can be abroad and still vote. That is fair and reasonable. “The Citizen Voting Act does not make any substantive changes to the eligibility requirements of the Canada Elections Act that were found unconstitutional by the Ontario Superior Court of Justice,” she said. Lori Turnbull, an associate professor at Carleton University’s School of Public Policy and Administration, said she thinks the government’s argument might be more successful with the public than with the judge. “I think they could make an argument that elections are for people who live here,” she said. Turnbull said she was unaware of any academic research suggesting how non-residents vote, but she added that the Conservative party knows better than anyone else how Canadians vote. O'Brien, the lawyer, said she was a bit surprised by the government had not waited for the outcome of the appeal. “The case is about whether or not residence is important to voting,” she said. “Our response was to say it is not that critical. There are a lot of people who vote in our voting system who vote in places where they don’t live or they can chose where their vote is counted,” she said. The new rules, however, she said, would make it impossible people who are gone for any period of time to have the proper identification to vote. There has been no concerns raised about residency fraud, “this is trying to address a problem that is not there,” she said. The election law was successfully challenged by two Canadians living in New York. Gillian Frank, a 34-year-old Torontonian who was living on Long Island, N.Y. while completing post-doctoral studies. Frank said he planned to return to Canada in an academic position but had been unsuccessful in his job hunt. The judge noted that Frank had tried to vote in the May 2011 election but discovered that he could not cast a ballot because he had been absent from the country for more than five years. “He felt strongly about voting in this election because he had been following Canadian politics and was concerned about a number of issues,” the judgment notes. The other applicant, Montreal-born Jamie Duong, lived in Ithaca, N.Y. Duong, the judge said, had voted in person in several federal and provincial elections but had been unable to return to Canada in 2011. Duong, who went to the United States to study at Cornell University had a job on campus but while trying to find an appropriate position in Canada. O’Brien said both were well-informed citizens with strong ties to Canada who felt passionately about being Canadian. Should Canada's Super-Rich Pay A Super-Tax?